After working what should be my final weekend, box office shift, I had an urge to purge. I’d been warning the hubs that we need to organize and clean our closets soon, and it happened today. 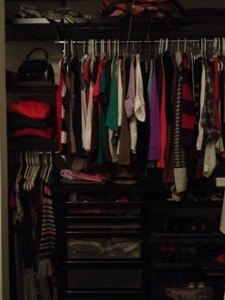 When I first moved in to his condo, the hubs had an Elfa closet from The Container Store installed so that we could both share the long narrow closet in the master bedroom. In order for all the shelves, bars and drawers to fit, we had to remove the bi-fold doors. “No worry,” we said. “Everything will look so nice because of the Elfa organization, we won’t need doors.” His side managed to stay that way (all he has are suits and dress shirts), but mine ended up looking a mess. But after spending some quality time being honest about how much I wear a lot of items, it now looks much nicer. Not only did we fill up two garbage bags full of clothes to sell/donate, we also went through all of our drawers and our coat closet. Everything is organized and neat. I even dusted the shelves! And I feel so much better. Sometimes happiness comes from an organized environment. I know, many times, I’ve sat down to do other work and just can’t when the space I’m in feels messy or cluttered. Taking the time to keep things nice just feels better! 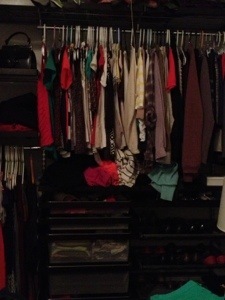 This is my half of the closet. It might not look extremely different, but I promise there is less of everything. And the drawers look amazing. Love this! Although always organized in other areas of your life, I recall a time when the manner in which your clothing was stored was on the floor of your bedroom. ha ha ha!